In today’s time, everyone wants to look fit and fabulous at all times. But it is also a well-known fact that losing weight isn’t an easy thing to achieve. However, not everyone is willing to change their current lifestyle. Changes always prove to be challenging in the beginning. And not all changes are bad. The adaptation to change might seem difficult at first. These days, more and more people are opting for TRX for weight loss. One should start off by swearing off foods labelled low-fat or low-calorie food. It is because these foods have several adverse consequences for one’s health. The low-fat foods are packed with sugars, salt and artificial sweetener. People should instead opt for whole foods sans any added sugars, salts and chemicals. The body can process whole foods in a better and quicker way. Thus, one should opt for foods that are closer to their natural states. It is a myth that crunches are the best for losing belly fat. Experts say that crunches are among the least effective exercises for slimming one’s waistline. People wanting to work on their problematic areas should think differently. Instead, they should focus on fitness of the entire body. It is because the total body workouts challenge the entire body. The full body exercises burn more amount of calories. These exercises also improve one’s functional fitness. TRX suspension training is an incredible full body challenging workout. All the TRX exercises offer a huge metabolic effect. There are times when people tend to miss their workout sessions for different reasons. Then they try to make up for the missed sessions with a workout marathon at the gym. It is not only exhausting but also kills one’s workout motivation for the days ahead. One meal doesn’t make one fat or out of shape. Similarly, one rigorous exercising session doesn’t help in shedding off the kilos. It is all about taking baby steps consistently for an effective weight loss process. Also, it is the simple everyday things that count. People should focus on eating smaller meal portions. They should avoid junk and oily food. One should also do some exercise on an everyday basis. It is necessary because it significantly contributes to one’s strength, mobility and fat loss goals. People mainly focus on eating right during their weight loss process. Even though, eating right is a necessary lifestyle change people must make when trying to lose weight. Including exercise in one’s life is the major lifestyle change that people should also be choosing. People should get a gym membership for losing weight. When one tries to work out at home, it can be hard. It is because finding the motivation for exercising alone at home isn’t something that everyone can manage. People with no motivation end up missing their workouts most of the days. When people join a gym, they pay money for the membership. Thus, this acts as a motivational for hitting the gym and doing the workouts. People should start off by finding a friend for working out together. It will act as a motivating factor for getting the exercises done. Working out alone in the very beginning can prove to be tough. But when people have someone for encouraging them, it always proves to be helpful. Thus, people find it easier to push themselves more every time. Workouts with a friend or family member also help in knowing whether the exercise is showing results or not. Only getting a gym membership isn’t enough. People who take classes at the gym have some of the best workouts. It is almost impossible for most people to do an effective workout on their own. It doesn’t have to do with anything how hard they try or not. Exercising sessions are always better when there is someone for encouragement. One needs the program along with the hard work for making the weight loss happen. Some people don’t see their weight going down. That is where a gym class comes in handy. 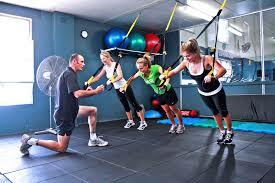 TRX for weight loss is the most preferred gym class option. One can also opt for spinning or an abs class. Last but not the least; creating a schedule and sticking to it. It is advisable to have a workout routine for 4-5 days every week. People with a set schedule can push themselves into following it. People will see the effects of the sticking to the schedule as it helps in shedding off the kilos. Ones opting for the gym classes should plan their workout time around their schedule for best results. The key is not to starve one’s self. When one starves, it does more harm than good. People should also avoid cutting off carbs from their diets entirely. One should include low-fat food that is rich in vitamins and minerals in their meals. Last but not the least; be positive during the entire weight loss process. As they say, it is all in the head. Yes, even shedding off the stubborn Pounds. I wanted to share with you something I created – the Home & Travel WOD Generator. It’s a free web page that will randomly provide one of hundreds of no-gym, no-equipment hotel and home friendly workouts. It also has a built-in timing function for Tabata, AMRAP, EMOM, or a plain stopwatch. It includes many classic CrossFit bodyweight WODs. This is a great tool you can provide to your members during the upcoming busy fall months – for those that may be on vacation, traveling for the holidays, or otherwise unable to make it to class. The web page is free, and will always be free – no ads, no pop-ups, no ask for an email address. If you think this would be of use for your members, would you consider sharing on Facebook or Twitter, posting a link on your WOD blog, or maybe in any “resources” pages you may have? Great article, I still struggling to lose a few extra pounds I out on after the Christmas period and work doesn’t allow me to do as much training as I would like nowadays, this trx training looks like it will fix my problem around my abdomen areas, thanks for all the helpful tips with this training.